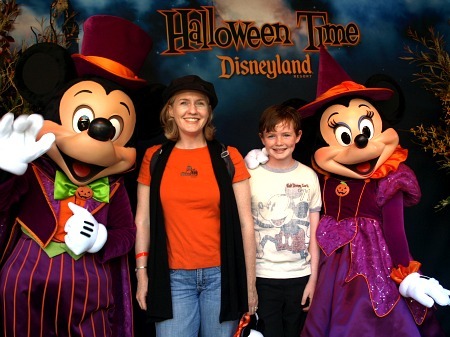 October 3, 2011, 10:36 AM · October means HalloweenTime at the Disneyland Resort. 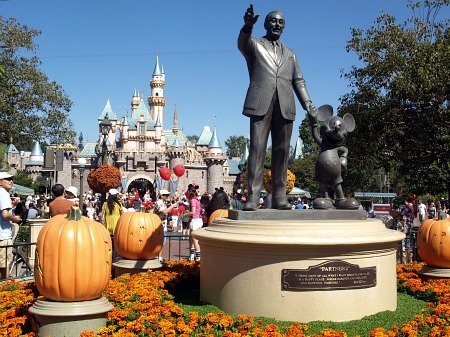 The big Mickey pumpkin's back in his place at the head of Town Square. 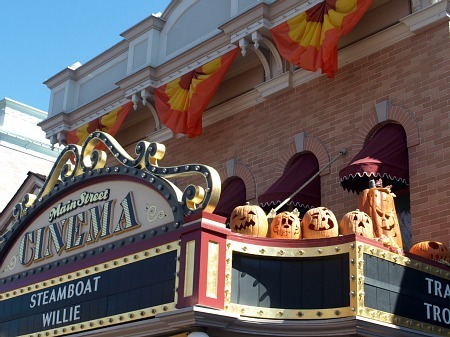 And don't miss the banners and jack-o-lanterns above every storefront on Main Street. The display extends all the way to the hub. 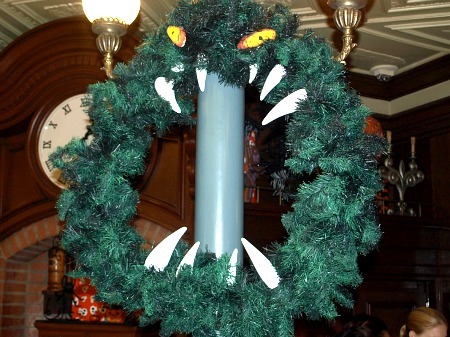 Beyond Main Street, you'll find additional Halloween decor in Frontierland and New Orleans Square. 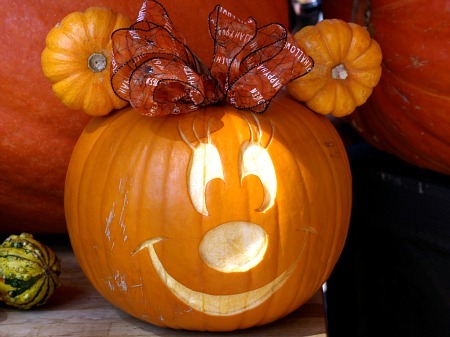 Keep your eyes open for some of the character pumpkins. You'll find the Cheshire Cat and Minnie Mouse in Big Thunder Ranch. 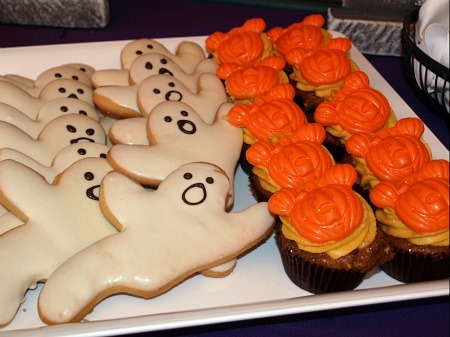 Decorations are nice, but Halloween's really all about the treats, isn't it? Getting hungry yet? 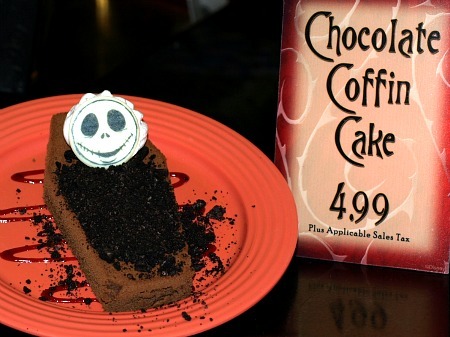 Disney's laying out plenty of Halloween-themed sweets for sale during the month. Including this "Coffin Cake," at the French Market. 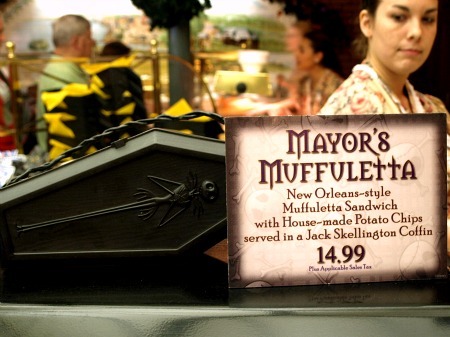 Disneyland's also offering some Halloween-themed entrees, such as the "Mayor's Muffuletta," also at the French Market. 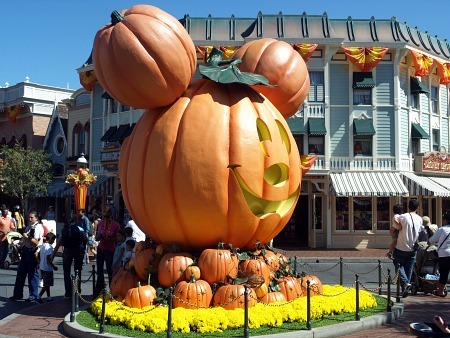 If that's not enough, and you're in the mood for all the candy you can eat, I'd recommend the Mickey's Halloween Party, Disneyland's family-friendly, after-hours trick-or-treating event, which we visited last year. 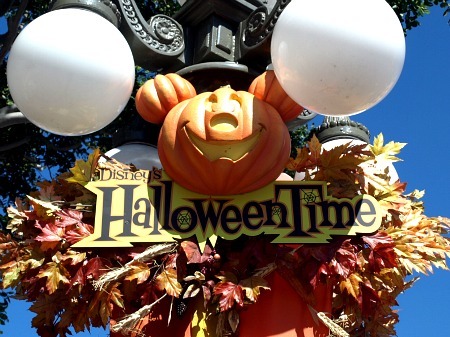 Next week, we'll take a look inside one of the highlights of HalloweenTime and Mickey's Halloween Party: Haunted Mansion Holiday. 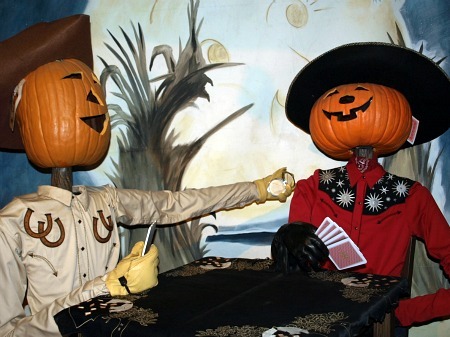 October 3, 2011 at 5:25 PM · My girls really enjoy watching cast members carve character pumpkins back at Big Thunder Ranch. Also...great opportunities exist for villain autographs/photos back in Fantasyland (as well as other places, I'm sure). We found Captain Hook, the Evil Queen, Honest John, the Sherriff of Nottingham, Cruella de Vil and the Queen of Hearts on a recent visit. In fact, we watched the Evil Queen comforting a small girl after Honest John pretended to walk off with her and she started crying. Very surreal. We'll go again on Friday and see who else we can "scare" up. 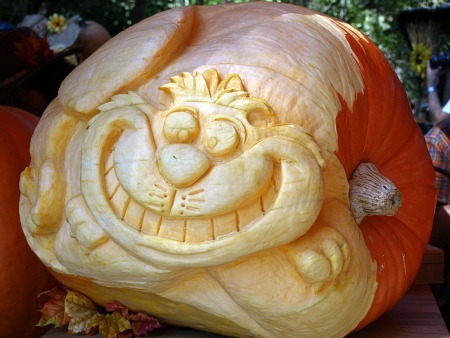 October 3, 2011 at 9:56 PM · Great!